QNAP this week introduced its new family of 16-bay enterprise-class NAS based on AMD’s Ryzen processors. The new TS-1677X devices support Qtier automatic data tiering and SSD caching technology as well as 10 GbE and Multi-Gig Ethernet connectivity. Interestingly, QNAP ships the NAS with with its QuAI developer package that can be used to optimize the NAS for AI, ML, and DL applications. 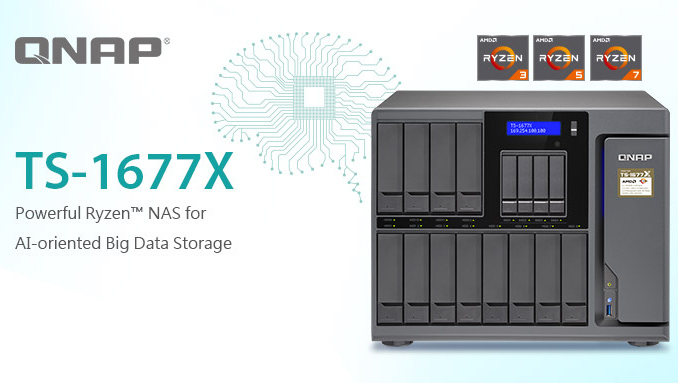 The QNAP TS-1677X is powered by AMD’s Ryzen 1000-series processors with up to eight cores & AES-NI encryption engine, as well as up to 64 GB of DDR4 memory. The NAS features 12 3.5-inch hot-swappable bays for high-capacity hard drives, and four 2.5-inch hot-swappable bays for SSDs to be used for caching. In addition, the NAS has three PCIe expansion slots (one PCIe 3.0 x8, one PCIe 3.0 x4, one PCIe 2.0 x4) that can be used to install additional high-performance M.2 SSDs using special add-on adapter cards, additional 10GbE/40GbE networking card(s), or a GPU to accelerate highly-parallel workloads such as those used for AI, ML, and DL applications. For connectivity, the device uses two 10GBASE-T network controllers (presumably from Aquantia) that support 10 GbE, 5 GbE, 2.5 GbE, 1 GbE, and 100 MbE speeds over conventional cables (so presumably a controller from Aquantia, unless Intel has something unannounced). In addition, the system has two GbE headers, and eight USB 3.0 Type-A/Type-C ports. The key feature of the QNAP TS-1677X is the combination of formidable compute performance (a CPU with up to eight cores and a GPU for highly-parallel apps) and storage capabilities (12 3.5-inch 14 TB HDDs can store 168 TB of data) that can be used for traditional NAS use-models as well as emerging applications, including but not limited to video streaming, video surveillance, AI, ML, DL and so on. Like other Ryzen-based NAS from QNAP, the the QNAP TS-1677X runs the company’s QTS 4.3 operating system that supports a variety of storage specific functionality, including RAID (RAID 0, 1, 5, 6, 10, 50, 60, JBOD), Qtier technology that routinely arranges regularly used file/data into tiers (by moving repeatedly used data to SSDs), encryption, snapshots, Qsync cross-platform file sharing (for Apple, Windows, and Linux machines), one touch copy, and so on. The QTS 4.3 also supports first-party and third-party apps that further enhance functionality of the product. Meanwhile, the QTS Virtualization Station can run multiple virtual Windows/Linux/Unix machines on a NAS (the QNAP TS-1677X is VMware, Citrix, Microsoft Hyper V, and Microsoft Windows Server 2016 ready). Moreover, the new NAS supports vQTS that allows to run multiple virtual QTS systems on one NAS. Bays 12 × 3.5", 4 × 2.5"
Other I/O Monochrome backlit LCD display, IR receiver, voice allert, buzzer, etc. Dimensions Height 303.84 mm | 11.96"
Width 369.9 mm | 14.56"
Depth 319.8 mm | 12.59"
QNAP will offer four models of the TS-1677X NAS with various CPUs and different amount of memory. The manufacturer did not disclose prices, but since we are talking about enterprise-grade NAS, they are not going to be low. > For connectivity, the device uses two 10GBASE-T network controllers (presumably from Aquantia) that support 10 GbE, 5 GbE, 2.5 GbE, 1 GbE, and 100 MbE speeds over conventional cables (so presumably a controller from Aquantia, unless Intel has something unannounced).